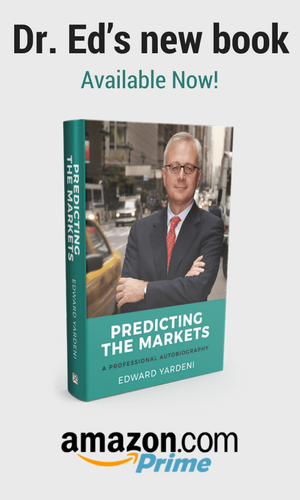 Economist and investment strategist Ed Yardeni discusses his new book, Predicting the Markets: A Professional Autobiography, and offers his thoughts on why the nine-year-long bull market in U.S. equities can continue. Listen to hear his straightforward rationale. (1) Revenues at all-time high. Most extraordinary is that S&P 500 revenues jumped 10.3% y/y last quarter to a new record high (Fig. 1 and Fig. 2). Normally this far into an economic expansion, revenues growth tends to be around 4%-6%. (2) Earnings at all-time high. S&P 500 earnings as measured by Thomson Reuters I/B/E/S soared 25.6% y/y last quarter, reflecting the strength in revenues as well as the cut in the corporate tax rate (Fig. 3 and Fig. 4). (3) Profit margin at all-time high. Notwithstanding all the chatter about rising costs, the S&P 500 corporate profit margin rose once again to a record high of 10.9%. It was at a record 10.1% during Q4-2017 before the tax cut. It jumped to 10.5% during Q1-2018 thanks to the tax cut. Yet here it is at yet another record high. The bears have been growling during most of the current bull market that the margin is about to revert to the mean. (4) Leading higher. The yield curve is just one of the 10 components of the Index of Leading Economic Indicators, which has been setting fresh record highs for the past 17 months through July (Fig. 5). That augurs well for the Index of Coincident Economic Indicators, which is also at a record high. This index’s y/y growth rate is highly correlated with the comparable growth rate for real GDP (Fig. 6). The former was 2.4% through July, confirming that the underlying growth of the economy continues to fluctuate between roughly 2%-3%, i.e., at a sustainable pace. The latest GDPNow estimate shows real GDP growing 4.3% (saar) during Q3. That translates into a 3.2% y/y growth rate. (5) Trade war. President Trump unilaterally has called a ceasefire in his trade war with Europe. Progress reportedly is being made in negotiations with Mexico. Talks will resume with China later this month. Perhaps it’s time to stop using the adjective “escalating” to describe the trade war? What if all this leads to less protectionism once the fog of war clears? This possibility sure helps explain why the US stock market has performed so well so far this year! (6) Inflation. It’s true that there are more signs of mounting inflationary pressures. They just aren’t bubbling up into the PPI, CPI, and wages. To have cost pressures rising even as profit margins likewise are rising without discernibly higher price inflation is a curious set of circumstances. Could it be that productivity is finally making a comeback? That certainly would explain things well. Also, the strong dollar is helping to keep a lid on inflation. Recently, commodity prices have been falling, not rising. (7) Earnings. There’s no doubt that earnings growth will fall from over 20% this year to under 10% next year. So what? Earnings should still be growing in record-high territory in 2019. Stock prices should follow suit. YRI Fundamental Stock Market Indicator remains bullish for stocks. US stocks have been outperforming other major overseas stock price indexes since early February. That’s when President Donald Trump started his “America First” protectionist campaign aimed at making free trade fairer trade with America’s major trading partners. During the current bull market, I had been recommending a Stay Home investment strategy until the fall of 2016. On November 8, 2016, I switched to a Go Global strategy on mounting evidence that the global economy was rebounding from the worldwide energy-led mini-recession of 2015. I switched back to Stay Home in early June of this year in response to the escalating trade war. US stocks have outperformed the major overseas stock indexes priced in local currencies so far this year. They’ve done even better when foreign indexes are priced in local currencies because the dollar has soared in response to Trump’s escalating trade war (Fig. 1). Meanwhile, the 10-year US Treasury bond yield has remained below 3.00% since May 24. All this suggests that the greenback and US financial assets are viewed as the winners in a trade war. However, Stay Home isn’t all about a risk-off approach to overseas economies. In fact, I believe that the outperformance of Stay Home so far this year also owes a lot to Trump’s stimulative tax cuts at the end of last year. The preceding statement doesn’t seem to apply to the trade-weighted dollar, which jumped 7.4% since the year’s low on February 1 (Fig. 2). That coincides with the implementation of Trump’s America First trade campaign. I have often observed that the dollar tends to be strong (or weak) when the rest of the world is looking relatively weak (strong). That explains why the dollar tends to be inversely correlated with commodity prices, as measured by the Goldman Sachs Commodity Index (GSCI) (Fig. 3). So far this year, the GSCI is holding up reasonably well. However, it is heavily weighted with the prices of petroleum products, which have been propped up by looming US sanctions on Iranian crude oil. Looking somewhat weaker is the CRB raw industrials spot price index, which has been weighed down by a significant drop in the price of copper in recent weeks. The price of copper remains highly and inversely correlated with the value of the dollar (Fig. 4 and Fig. 5). Of course, some of the relative weakness in the rest of the world reflects the relative strength provided the US economy by Trump’s tax cuts. In other words, the dollar’s strength isn’t all about the trade war. Fed officials continue to say that while the trade war may be a threat to US economic growth, they believe the economy will remain strong enough to justify further hikes in the federal funds rate from 1.75%-2.00% currently to possibly 2.75%-3.00% next year. Meanwhile, both the ECB and BOJ show no signs of normalizing their official interest rates, which remain abnormally low just below zero (Fig. 6). The main reason why Stay Home has been outperforming Go Global since the start of the bull market is that the forward earnings (i.e., the time-weighted average of consensus estimates for this year and next year) of the US MSCI stock price index has outpaced the forward earnings of the All Country World ex-US MSCI (in local currencies). The former is up 172% since it bottomed during the 4/30 week of 2009 through the 8/2 week this year, while the latter is up 78% over the same period (Fig. 7 and Fig. 8). Helping stocks to recover from the year’s lows in early February is the eerie calm in the US bond market. The Bond Vigilante Model suggests that the 10-year Treasury bond yield tends to trade around the growth rate in nominal GDP on a y/y basis (Fig. 1). It has been trading consistently below nominal GDP growth since mid-2010. The current spread is among the widest since then, with nominal GDP growing 5.4% while the bond yield is around 3.00% (Fig. 2). Why isn’t the bond yield closer to 4.00% or even 5.00%? After all, the Tax Cuts & Jobs Act enacted at the end of last year and additional fiscal spending passed by Congress earlier this year are projected by the Congressional Budget Office to result in federal budget deficits averaging about $1 trillion per year for the next 10 years (Fig. 3). Furthermore, the FOMC commenced tapering its balance sheet last October and plans to continue doing so through the end of 2024 (Fig. 4). The Fed is on track to slash its holdings of Treasuries and MBSs by $2.5 trillion and $1.7 trillion, respectively, over the next seven years! Oh and by the way, the FOMC is on track to raising the federal funds rate to 3.00% by the end of next year from 1.75%-2.00% currently. (1) Near-zero yields in Germany and Japan. The 10-year German government bond yield has dropped from this year’s high of 0.77% on February 2 to 0.45% 0n Tuesday (Fig. 5). Germany may have been hit by uncertainty created by Trump’s trade war. The IFO Business Confidence Index has been falling all year, with its expectations component the lowest since March 2016 (Fig. 6). In any event, the ECB has indicated that the bank’s key interest rates will remain at historical lows at least through the summer of next year! Wow, lots of agita about nothing! The BOJ also acknowledged that it will take “more time than expected” to achieve its inflation target of 2%. You think? The BOJ’s monetary base has more than quadrupled since April 2013, when Haruhiko Kuroda, the new head of the bank back then, slammed on the monetary accelerator and never took his foot off of it (Fig. 7). Most of the time since then, through June of this year, Japan’s CPI inflation rate has remained closer to zero than 2.0% (with the exception of 2014, when the sales tax was raised significantly) (Fig. 8). (2) Subdued inflation. Back in the USA, the latest inflation figures remain relatively benign: Not too hot, not too cold, just warm enough to allow the Fed to proceed with the gradual normalization of monetary policy. The headline PCED rose 2.2% y/y through June, while the core increased 1.9% over the same period (Fig. 9). The wage component of the Employment Cost Index held at 2.9% y/y during Q2 (Fig. 10). That’s the highest pace since Q3-2008, but still relatively low given the tightness of the labor market. (3) Record wealth, with lots set on risk off. That still leaves an important question: Why aren’t bond yields rising in anticipation of all the debt that will need to be financed? There is already a record amount of debt everywhere, and more coming can’t be good for bonds. There is also a record amount of wealth in the world. Some of it tends to be managed with a risk-off bent. Ironically, people who expect that “this will all end badly” tend to buy government bonds because they are deemed to be among the safest assets.